Oh boy - surely not? Last night I logged on to Pete Abe's blog only to be faced with this story and the possibility of the Yankees opening day starter being none other than Carl Anthony Pavano. The oft-injured right hander could be moved up following the DL move of expected starter Chien-Ming Wang and the back spasm problems of Andy Pettitte. Mike Mussina has been ruled out as Joe Torre wants to keep him on regular rest meaning that Pavano, the pencilled #4 starter is now the favourite to take the ball on opening night although Kei Igawa, Jeff Karstens and even Darrell Rasnar can't be ruled out just yet. If it is to be Pavano, then it'll be quite a turnaround for the former Florida Marlin. After two disappointing seasons in the Bronx, culminating in him not throwing a pitch in anger at the big league level last season, Pavano has got a lot of work to do if he is to repay the huge contract that he was awarded in the 2004/2005 off season, not to mention having to win back the respect of his fellow players and fans. Wang's hamstring injury isn't cast as serious, and he is fully expected to return to the rotation by the time the calender flicks over to May. Pettitte may still be fit and ready to take the ball on opening night, but from sitting in a fairly comfortable position with a fragile rotation a week ago, suddenly the question marks are flying once more. It was nice having one of the strongest rotations (on paper) in the majors while it lasted... just a pity it didn't even make it one time through that rotation. It was announced last night that Papelbon had requested a move back to closer, and that the Sox were willing to accommodate him. You have to wonder whether he would even have made the request had the Sox been able to find someone who had been able to step up into that role, or if the club had had the confidence to stick with the plan. Why did the team not simply tell Jonathan that they appreciated the offer, but they would let the first month of the season play out, and if no one in the pen stepped up the way he did the year before, then they would take him up on that offer? But we now have a rotation that includes both Wakefield and Tavarez, and as ugly a prospect as that is this year, it also creates a hole in the rotation for as many years as we should have been counting on Papelbon as well, unless we go through this farce every year. Pete (San Diego): Jim, whats your take on Papelbon remaining as the Sox closer for this season? Does this mean the Sox go hard after Clemens? SportsNation Jim Caple: It's a mistake. As Steve Buckley and I write in "The Best Boston Sports Arguments'' (shameless plug for my book), the closer is the most overvalued position in baseball. Think of how many guys came out of nowhere to be effective closers (Eddie Guardado, JJ Putz, etc.) and you realize how replaceable that role is. A good pitcher is always more valuable than a closer (my bold). And don't give me how devastating it can be to lose a game in the ninth inning Sure it hurts. But you remember the loss because it happened at the end of the game. no one remembers how many games you lose earlier because a mediocre starter dug you into an early hole in the second inning, then forced you burn out the bullpen for the next game. That sums up so much more of baseball for me than just this argument - we remember the memorable, we forget the mundane - we will forget how many games we don't get to a closer because we are carrying two, frankly, less than ordinary pitchers in our rotation, but we would remember a blown save by Joel as if the world had collapsed. For a team that seems to rely a great deal on the analytical, this is a strange move, and while you can hold out faith that there are other irons in the fire - perhaps a belief that Lester is likely to be in the majors in a months time, or a greater awareness of Clemens thought process than we know - they do seem to be making some strange decisions - $4m for Pineiro to not even try closing in 2007? 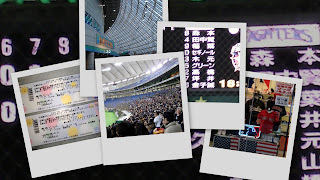 Well my first spring training game... we might have to change the name of the blog to 6,753 Miles from Tokyo Dome, although it is only 6,736 miles from my current home if you go the other way round the world! The atmosphere itself is the first thing that a baseball fan would notice - although for UK football fans, it wouldn't seem so strange. In the right field bleachers, the home team, in this case, the fabulously named Hokkaido Nippon Ham Fighters (official web site here - although they really weren't at home if you read the history at the first link, or can translate at the second), had a singing section - with band, flag wavers, synchronized singing and fans in the same outfit. While in the left field bleachers, the equally gloriously named Tohoku Rakuten Golden Eagles (official web-site here), had their singing section, complete with band, flag wavers, etc, etc - and they just kept going and going - the game situation didn't seem to matter, and I wish I could tell what they were singing, but... just incredible! I don't imagine there was formal segregation as in football in the UK, but presumably fans that want that type of experience and involvement just know which section to go to. The fan experience was pretty cool - a ticket cost 3,000 Yen - about $25 - and for that you could sit in any seat in the lower bowl - I presume this was only because it was a spring training game (regular season game tickets for the seats between the 1b and 3b are apparently 5,000 Yen or $42) - so that meant we were able to sit behind home plate, about 15 rows back, behind the 'safety' net - although that was another difference of note - in the Tokyo Dome, there was a safety net all the way along the 1st and 3b side, seemingly to beyond the distance that you might expect to be in danger from a line drive foul ball. Other differences? no national anthem, no 7th inning stretch (although it did appear that the Ham Fighters' mascot led the bleacher crew in singing a Nippon Ham Fighters 'fight song'), the in-aisle sales offering included whisky... yep, get your hard liquor in your seat, and of course, the 8th inning clean up - where a stadium steward walked up and down each aisle and collected everyone's garbage (no piles of peanuts in the rows, just a nice shiny polished floor) - everything else seemed pretty much the same, including grown men fighting off small children for the honor of catching a foul ball. The game itself ended a 5-2 win for the Nippon 9 - although given it was spring training, it really was the Nippon 20... you know that you are at a spring training game when the home team, up by 3 runs, easily gets the first 2 outs in the top of the 9th, bases empty... and calls for a pitching change! Given it has been too long since I have seen a live game, tonight was an excellent way to start a new season - only 21 days until I am able to blog about Dice-K's home debut! What goes through the mind of A-Rod? I have to admit I waver on A-Rod, he is without a doubt the player with the most natural skill in the game, a gracious swing, a power bat and a player who has Gold Gloves in his back pocket. He was the player who should be lauded as the anti-Bonds, a player who could appeal to all, the perfect smile, the good looks, the skill, the world was at his feet but he keeps failing at being that person. He signed that contract in Texas which wasn't his fault and then he dissed Jeter in that article - it was a bad move that would come back to bite him in the bum in the future. After he left Texas he described it as 'playing with 24 kids' again showing a distinct lack of class even though he was probably speaking what he saw as the truth. Now he's in New York, the home of the goldfish bowl, the pressure is on 24/7 and he's back alongside Jeter. He comes into 2007 with an option to leave his contract and potentially get out of New York and bolt to Chicago to join up with his mentor Lou Pinella or possibly go to the west coast. The option is one that he will trigger, he will get out of his contract because he can earn more as a Free Agent, it is just sensible. The only question is whether or not he'll trigger the option and then stay in the Bronx. Yesterday on the Mike & The Mad Dog show on WFAN, he laid the foundations for his escape - the fans. He in essence said 'if I'm booed and I leave - it'll be their fault'. Every player wants to be praised by his fans and they will give you a pass for so long but even Jeter (during his two-month long slump in 2005) have heard the boos ringing out from the faithful. This is in essence a contract year for A-Rod, a great year for him personally would see him cash in during the off-season and in turn it would help the team. The goal for every Yankee is to win the World Series, every year it is the same thing, you agree to play for the Yankees knowing the pitfalls and the pressure that this brings. He has the best agent in the game in his corner, so why does A-Rod deal with the press so badly? It was broadly accepted that his opening speech of camp cleared the air, everything seemed to be going smoothly and he goes on radio and publicly talks about possibly leaving the club and once again becoming the centre of attention. One thing we've seen in the playoffs is that A-Rod doesn't perform well under pressure and yet he insists on being the man and piling pressure and the empathises on himself. I always say that one of the most important things in life is to learn from your mistakes, this is something A-Rod is failing to do. Just keep smiling, keep saying that you want to play in New York, no buts, no ifs, and play your game. Your game is good enough to do all the talking there is no need to use your mouth to talk, the problem seems to be that he feels he has to use his mouth as well, and that in turn effects his bat and the endless circle repeats itself yet again. Play hard and you'll be cheered - it is pretty simple. I know it sounds almost too simple but that it how it is. It is expected that you'll test the FA waters in the off season so don't worry about how you'll come across, let's cross that bridge as and when. For now just play the game and enjoy the ride. In the new era of "always truthful (TM)" A-Rod, even when he says what he really thinks, it seems people can't agree on his agenda. My first knowledge of anything to do with the story was ESPN's interpretation... it couldn't be any clearer could it? "I want to 100 percent stay in New York"
The New York Post captions it 'Now it's up to you New York', with their interpretation being that another year of fan abuse, and the Rod is gone... The New York Daily News is just as blunt - 'A-Rod: Love Me... or Else', with the same message that links A-Rod's future in New York with the attitude of the fans. Even the paper of record heard the same message. Alex told us several times that he wants to stay in New York. But just a few hours earlier, he drew a line on a map and it led right to Anaheim or Chicago or wherever he wants to go. It is always interesting on this beat. Always. Anyone want to set a date on the over / under for the end of the "always truthful (TM)" era? I wonder how many Yankee fans and officials believe this to be the case? A lifetime losing pitcher signed a four-year $39.95m dollar deal after the 2004 season and stated that he was glad to be a Yankee. One thing he wasn't glad about though was his contract, one that he felt wasn't enough and has refused to pay the agent who brokered the deal his standard 5% cut according to Jon Heyman over at SI. I have tried to be on Pavano's side, he's having a bad run of things but really, this isn't what you expect nor want. He has been paid the best part of $20million over the past two years without really earning the money after a string of various injuries. It was widely reported at the time that Pavano has bigger offers on the table from other clubs so if money was suc an object then why didn't he go and play for one of them. Carl Pavano has been the worst decision that can be solely placed at the feet of Brian Cashman, and it has been a big one, but for Pavano himself to be complaining is disgusting. He should pay up, he's a multi-millionaire, his agent did the job he was employed to do, and Pavano should concentrate on earning his crust and pitching in the big leagues instead of having to deal with court cases. The Astros, the Yankees and the Red Sox - the three teams who are in the hunt for another Rocket blast off. Last night the seven-time Cy Young award winner was visiting the Yankees to watch his buddy Andy Pettitte pitch, and whilst he was there he spoke with the boss and visited Ken Singleton and Al Leiter in the broadcast booth. All those who've spoken to him said that they believed he would pitch again, including Andy Pettitte and Derek Jeter who had played golf with him and shared dinner respectively the previous day. The Rocket tried not to say too much but one thing is clear, he isn't interested in pitching for a team that doesn't provide him with run support. Whilst we are only in pre-season and are not sure how the Astros offense will stack up, it would be fair to think that the Astros do not have the inside track. This leaves the two AL East offensive juggernaunts - the Yankees and the Red Sox. The Rocket himself said that he didn't know many of the players on the Red Sox and a lot of his close friends were on the Yankees. All the signs point to a reunion in the Bronx sometime in June or July for a half season stint. Some fans will not think it is worth it and that the money could be better served in other areas but I'm a Clemens guy and believe that 15 games from him in the regular season and a handful in the postseason could really help this ball club, and I for one, would look forward to seeing him back in Pinstripes later this year. I have to be honest and say that while I love baseball, and spend far, far... far too much time obsessing about the game, I really don't follow prospects in any depth - even in the Sox system I just read what I read, and then throw in a healthy sprinkle of salt - who knows how many of these guys will ever make a valuable contribution? Seriously, how many of them will even ever pull on the laundry in the first place? However, Neil and I are in the middle of the minor league section of our fantasy league draft - you know that people are taking the 'keeper' element of the league seriously when they are drafting guys that are still playing in college ball, and are likely 3 or 4 years away from contributing anything significant at the major league level - and in the same way that fantasy baseball makes you take a far greater interest in a wider universe of players than just the home town team, having minor league keepers increases your interest in that level of talent as well! Keith (East Brunswick, NJ): D-Mat is numero uno on the prospects list for 2007, yet there isn't a single mention of his Japanese counterpart, Kei Igawa. What gives? SportsNation Jim Callis: Matsuzaka is going to be a No. 1 or 2 starter. Igawa is going to be a No. 4 or 5. He'll win some games on the Yankees, but he's more of a back-of-the-rotation guy. SportsNation Jim Callis: Not really. I think the Red Sox are going out of their way not to rush him. But they may not be able to resist if he continues to dominate like he did last summer. Stephen (NY): Why no love for Tyler Clippard? He had a great second half last year and he looked sharp in his first action of the spring. SportsNation Jim Callis: The Tyler Clippard questions never end . . . We don't not love Clippard. But as I've said many times, his stuff isn't as good as his stats, so Yankees fans need to adjust their expectations accordingly. He'll pitch in the majors, probably as a No. 4 or 5 starter, maybe a No. 3. And while most Yankees fans probably think that's an insult, that's a compliment. Stephen (NY): Melky Cabrera or Jacob Ellsbury? SportsNation Jim Callis: Ellsbury. No comparison as center fielders. nick (boston): ellsbury- more johnny damon or juan pierre? SportsNation Jim Callis: Closer to Damon. The Ellsbury questions are interesting - the first few games of ST have been my first chance to see him, and while sample size, quality of opposition etc, etc need to be taken into account, he really has looked good. Joe (NY): If you're Cashman, who do you trade Phil Hughes for? Santana? Dontrelle? SportsNation Jim Callis: If I'm Cashman, no way do I trade Hughes. John (Portland, ME): I can understand not trading Hughes for Willis, but you wouldn't trade him for Santana? SportsNation Jim Callis: Well, the Yankees do have seemingly unlimited money, so they could afford to pay Santana $20 million a year. But on a production to dollars ratio, I think Hughes would be the far, far better buy. I think he'll be one of the top 10 pitchers in the AL within the next couple of years. Regardless, Yankee fans clearly aren't alone in thinking that Hughes is going to be something special when he arrives!